Beaufort County United Way has partnered with FamilyWize to distribute prescription discount cards free-of-charge to everyone in Beaufort County. These cards can be used by the whole family and is for people with no insurance or for medicine not covered by insurance, Medicare or other benefit plans. 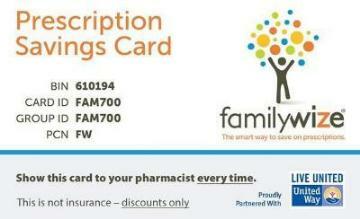 The FamilyWize Prescription Discount card can immediately lower the cost of medicine by an average of 30%.